Here is yet another successful meatless meal. Joey was actually surprised when I told him the "patty" was a mushroom. He just assumed it was turkey or beef given how flavorful it was. Success! 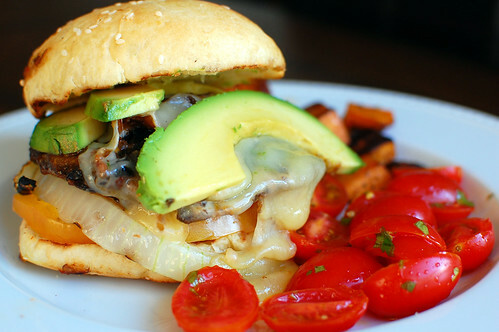 I'm honestly not surprised that its delicious - the mushroom caps are marinated in a spicy and flavorful chipotle dressing, grilled, and served on a burger bun with grilled onions, tomatoes, pepperjack cheese, and avocado. However, a word to the wise: don't make these for company or on a first date. They are incredibly messy to eat, and I would actually almost classify this as a fork and knife burger. Joey and I have been married long enough that neither of us cares about being neat and clean... and let's face it. No matter what I'm eating, I still manage to wear half. Quite honestly, Caroline may very well be a cleaner eater than her mother. We had a few mushrooms leftover, and I turned the ingredients into a salad for lunch. Another success! Loved this burger, and I'll be making it again and again this summer - just not for people that we need to impress. Combine the ingredients for the marinade in the food processor. Puree until smooth, and pour over mushroom caps. Turn to coat, cover with plastic wrap, and refrigerate 30 minutes - 1 hour. Preheat grill to medium-high heat. Skewer the onions, or prepare vegetable basket for grill. Grill mushrooms, gill side down, on the grill, brushing with extra marinade. Brush the onion slices with oil and season with salt and pepper. Grill alongside the mushrooms. After 3 minutes, flip the mushrooms and onions, and brush with remaining marinade. Allow to cook until tender and sizzling. Lay a slice of cheese over each mushroom and continue to cook until it is melted and bubbly. Brush buns with melted butter, and grill until toasted and lightly browned. 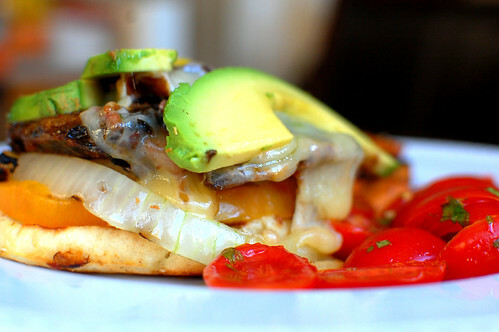 Starting with the bottom half of each bun, layer the onion, tomato, mushroom, and avocado. Serve immediately. Wow, these look incredible! I was going to do an actual burger on the grill this weekend, but I don't want to blow my diet. This seems not only like a great compromise, but it looks like it will be a whole lot yummier!!! Thanks for the amazing idea! Wow, this looks delicious. I'm making note of this recipe since I'm always looking for good meat alternatives. This looks fabulous! I love meatless meals, but I've never tried a burger like this! Sometimes the messiest foods are the most delicious. Case in point. This burger looks so fresh and tasty. Thanks for the idea. I can't wait to make these this summer! That portobello sandwich looks so good! This looks tasty! I'm going to try out the recipe tonight. wow its a healthy food good for our body, yummy!